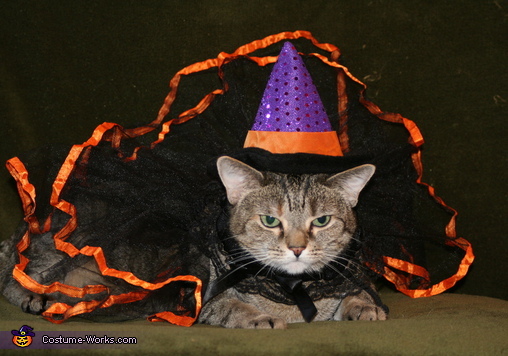 This is Tassy in a Witch costume. Cindy sent us more photos of her beautiful cats: Muffin the Pirate, Salem the Pumpkin Cat, Simba the Jester, Nakita the Witch, Rascal the Cowboy. This homemade costume for pets entered our 2011 Halloween Costume Contest, and won 3rd place in the Best Pet Costume nomination! My cats humor me by dressing up in various holiday attire! All of my cats are feral cats that I have tamed from the wild and given them the life of luxury, I have 8 in total. im dying to make my cat a witch hat but can not find a pattern for free, i dont have money to buy pattern is there any sites you know of?